Simon & Schuster Books for Young Readers, 9781442429208, 272pp. A teen embarks on the road trip of a lifetime in this authentic, beautifully written debut novel. Lyrical and moving prose from an original voice whose writing Judy Blume calls “luminous” deftly depicts the nuanced conflicts of early motherhood and the search for identity. Kristen-Paige Madonia is the author of Fingerprints of You, and her short fiction has been published in the Greensboro Review, The New Orleans Review, American Fiction, and Five Chapters. She holds an MFA from California State University, Long Beach, and now lives in Charlottesville, Virginia, with her husband and son. She teaches creative writing at the University of Nebraska, Omaha MFA program, the University of Virginia, and James Madison University. Visit her at KristenPaigeMadonia.com and @KPMadonia. "Lemon's thoughts, actions and feelings are palpable, and we are tugged along with her on her journey to find out who she is--and how much the imprints of those in her past and present will affect her future. Beautiful prose and a heartfelt story." "A strong first novel, Madonia’s coming-of-age tale reveals both flawed and compassionate characters." 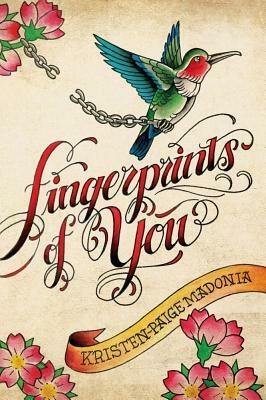 "Debut novelist Madonia offers an intimate reflection on the meaning of family...[a] thoughtful story about finding an identity and a home." "A character-driven...a well-written and thought-provoking debut." "Readers will appreciate the candidness of the writing. This compelling debut novel is sure to appeal." "The characters are complex, fully drawn people who make mistakes, change, grow, and remain likable through it all."